I love pumpkin pie, but I never make it or buy it, because I have one of those rare families that doesn’t really like pumpkin pie. One year early on, I made the mistake of getting a pumpkin pie, and I ended up eating all of it myself. The family choice has been blueberry pie at Thanksgiving, for the past 2 decades. My blueberry pie is killer, but in the fall, I really yearn for a piece of pumpkin pie. Sugar Pie Pumpkins have been all over the place these past couple of months, and are known for being sweeter, less watery, and less fibrous than other types of pumpkins. I’ve discovered that they are the perfect size for making a small pumpkin pie! Most sugar pie range 6″ to 8″ in diameter. I like to use the smaller ones. This one was only 5-1/2″ wide. Slice off the top third of the pumpkin. Clean and rinse out the seeds and fibers from the body and the cap. Bake the bottom and the top at 350 degrees for approximately 30 minutes, until the flesh is half cooked. The cap may be ready sooner, and you can remove it when it is done. A toaster oven is perfect for this. Remove from the oven and cool a few minutes. Use a sharp paring knife to cut the half cooked flesh out of the side walls, leaving at least 1/2″ of flesh attached for a sturdy bowl. Carefully use a spoon to scoop some of the bottom flesh out too, again leaving at least 1/2″ to 3/4″ of flesh on the bottom. If you scoop too much out, just pat the flesh back in so the pie doesn’t leak when it’s baking. Scoop any flesh off the cap too. Once you have 1 c. of pumpkin flesh, place it into a blender, along with 1 c. evaporated milk, 4 T. sugar and 3 tsp. pumpkin pie spice. Blend until smooth. Taste, add more sugar if needed, then add 1 egg and blend again. Pour filling into the pumpkin bowl almost to the top. In a small bowl, combine 3 T. flour, 1 tsp. sugar, 1/8 tsp. sea salt and 1-1/2 T. oil. Sprinkle over the the filling. Bake for another 50 minutes until filling is set. 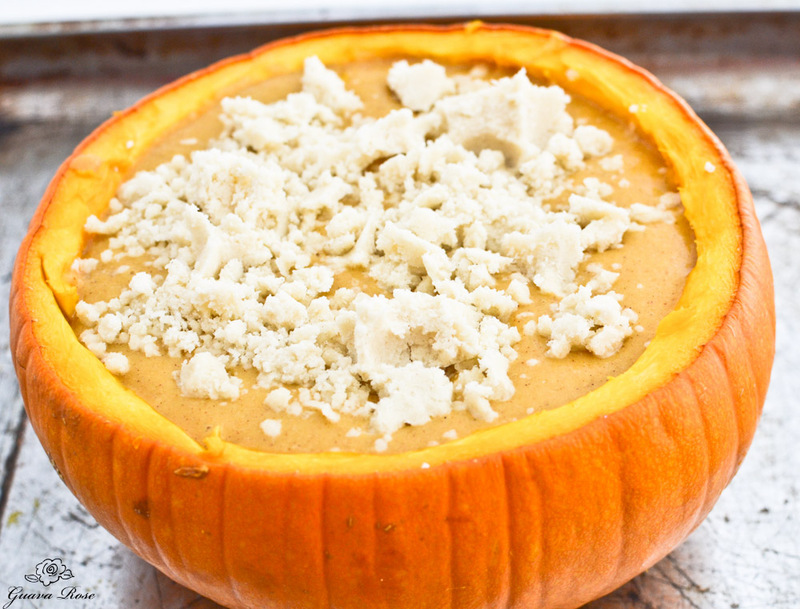 Any extra filling can be poured into the pumpkin top, or into a greased custard cup and baked at the same time. These will be done sooner, probably after 30 minutes or so. Cool completely. Pumpkin pie always tastes better to me cold, so chill it for at least a couple of hours before serving. Makes enough for at least 4 pretty good sized scoops– enough for me, and those who want a taste too. Perfect little taste of pumpkin pie. Preheat oven to 350 degrees (a toaster oven is perfect for this). Wash and dry pumpkin. Cut off the top third of the pumpkin. Scrape out seeds and fibers from the bottom and the top. Rinse out. Bake for about 30 minutes, until flesh is half cooked. Remove the pumpkin from the oven. Cool a few minutes. 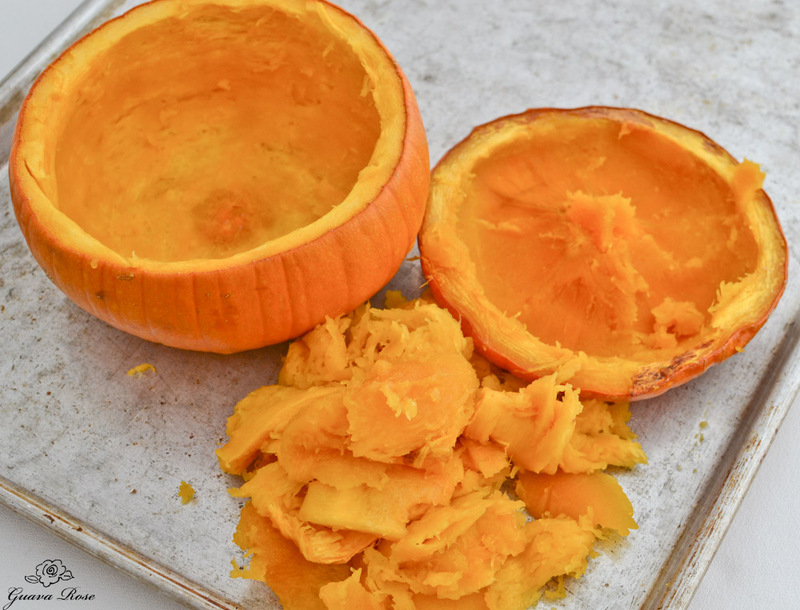 Use a small, sharp paring knife to cut off some of the partially cooked pumpkin from the side walls, leaving ½" flesh intact to prevent the pumpkin from collapsing later. Use a spoon to scrape some of the flesh out from the bottom. Scoop any flesh off the cap too. Scrape enough so you have 1 cup of pumpkin flesh. If you scrape too much from the bottom of the pumpkin and hit the skin, just pat some flesh back in there. Ideally you want the bottom to be ½" or more thick. Place the 1 c. pumpkin, milk, 4 T. sugar, and pumpkin pie spice into a blender and process until smooth. Taste and add more sugar if needed. Add the egg, then blend again. 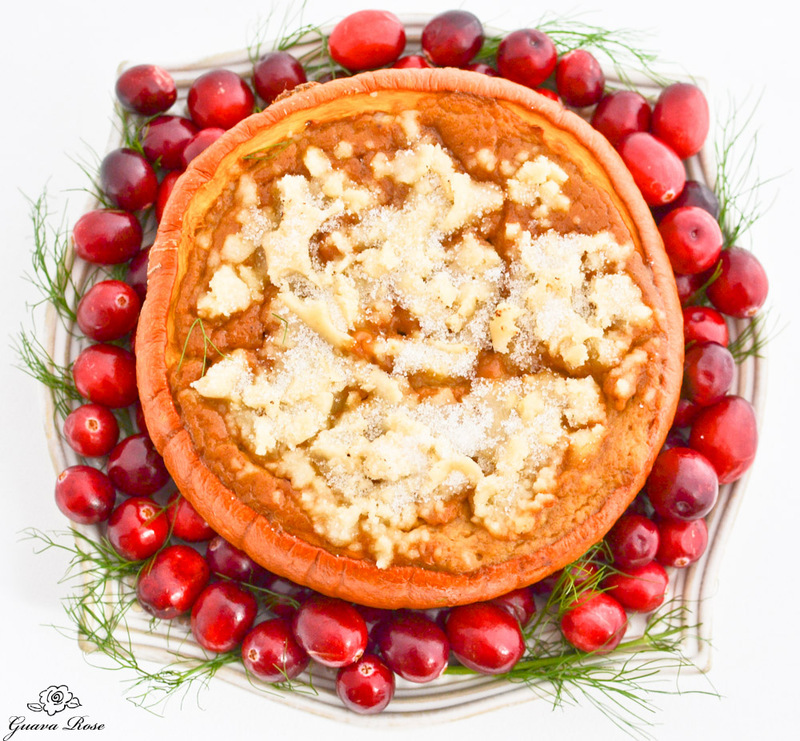 Pour the mixture into the pumpkin bowl, filling it up to ¼ " from the rim. 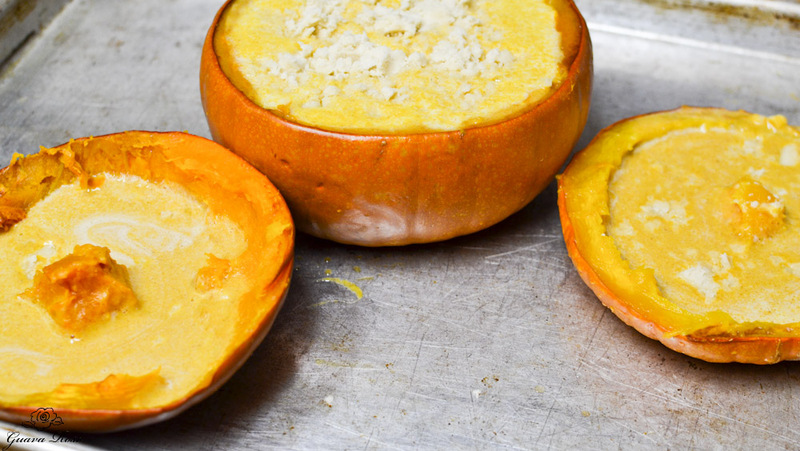 Any extra filling can be poured into the pumpkin top, or into a greased custard cup and baked at the same time as the filled pumpkin. In a small bowl, mix together the topping ingredients. 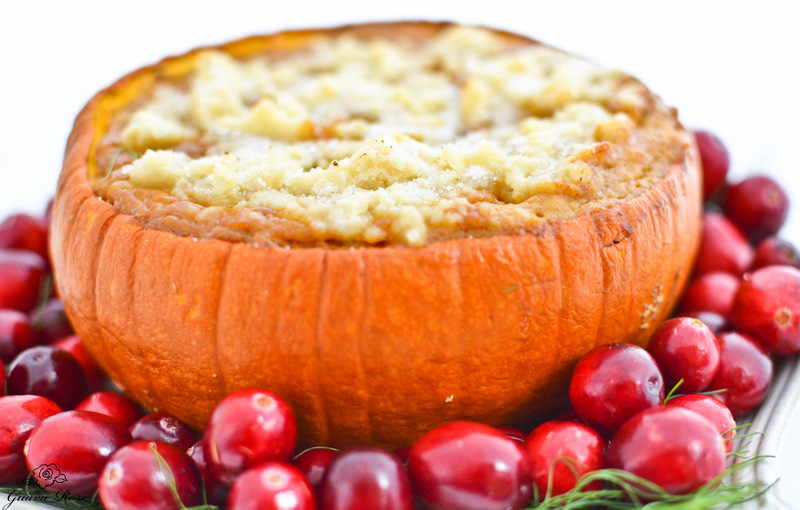 Sprinkle over the filled pumpkin. Bake at 350 degrees for about 50 minutes, or until the filling is set. Remove the pumpkin top and/or custard cup sooner, as they are done, probably after 25-30 minutes. Cool completely. Chill at least a couple hours for best flavor. To serve, scoop out portions into small cups or plates. Top with whipped cream if desired.